DALLAS, TX.- A magnificent 9.26 carat GIA D/IF Type IIa unmounted diamond is expected to bring at least $1 million to lead Heritage Auction’s Dec. 3 Jewelry Signature® Auction. 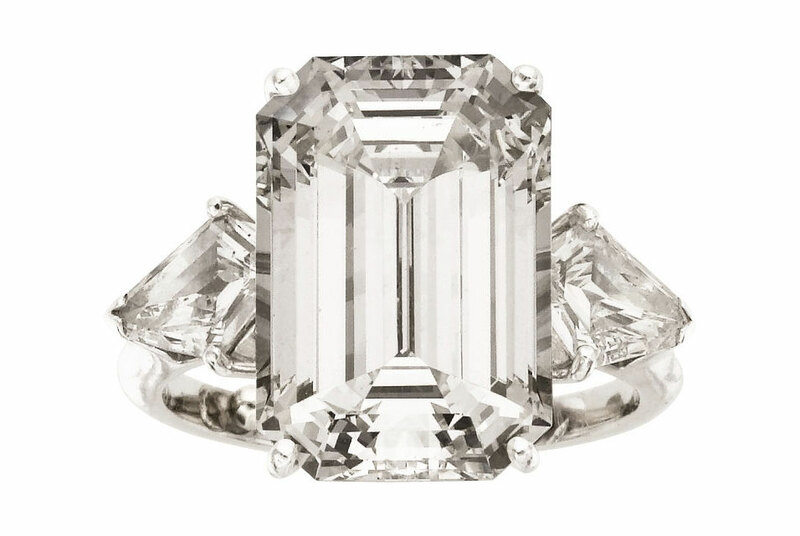 Diamond, Platinum Ring: The ring features an emerald-cut diamond measuring 16.12 x 10.83 x 7.01 mm and weighing 10.75 carats, enhanced by kite-shaped diamonds weighing a total of approximately 0.60 carat, set in platinum. A GIA Laboratory report # 12474845, dated March 6, 2003, stating H color, VS2 clarity, accompanies the center diamond. Gross weight 8.07 grams. Size: 7 (sizeable). Property from a Private Houston, TX Collector. Estimate: $300,000 – $350,000. “The exceptionally rare Type IIa diamond is about as perfect as a diamond can get. In fact, less than 2% of the world’s diamonds meet the Type IIa criteria,” said Jill Burgum, Director of Fine Jewelry at Heritage.